❥【DOUBLE LAYERS PROTECTION DESIGN】-The outer layer is made of ultra-high quality silicone coated fire-retardant glass fiber,inner aluminum flame retardant material adopted,high quality Black Non-itchy Liquid Silicone Coated Fireproof Fiberglass,resist heat up to 1200°C/2192°F.this bag is FIRE and WATER RESISTANT.And it comes with a fireproof zipper and velcro seal,Fireproof bag can fully protect your important documents, paper,birth certificate. ❥【15\'\'x11\'\'LARGE FIREPROOF BAGS】-Weight:270g/9.52oz,Foldable fireproof and waterproof folders, Fireproof file folder makes it suitable for daily filing and storing of documents,Can accept A4,A5 size or larger size! 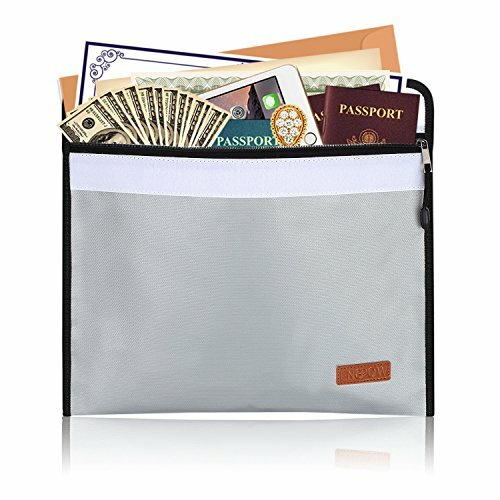 ❥【WIDE RANGE OF APPLICATIONS】- Fireproof zipper and velcro seal added security and safe transport.Not only can you put your file folder at home, office, car,it\'s also a good decision to put it in the safe box. You can feel 100% confident that your important information is in a safe place. ❥【ORIGINAL INTENTION】-Accidents happen when we least expect, and there\'s nothing more devastating than a fire that takes away valuable orone-of-a-kind paperwork, personal information, pictures or achievements. That\'s why we developed the fireproof bag- Protect your financials, personal information,including legal contracts, passports, licenses,disks and CDs,deeds, certificates, cash, letters, precious photos, money,gun, that won\'t let you down when emergency strikes. ❥【100% MONEY BACK GUARANTEED】- If you are not satisfied with our products for any reason, send it back for a 100% no questions asked refund. Nice size and great quality bag!